Good Friday preview: the big derby match! 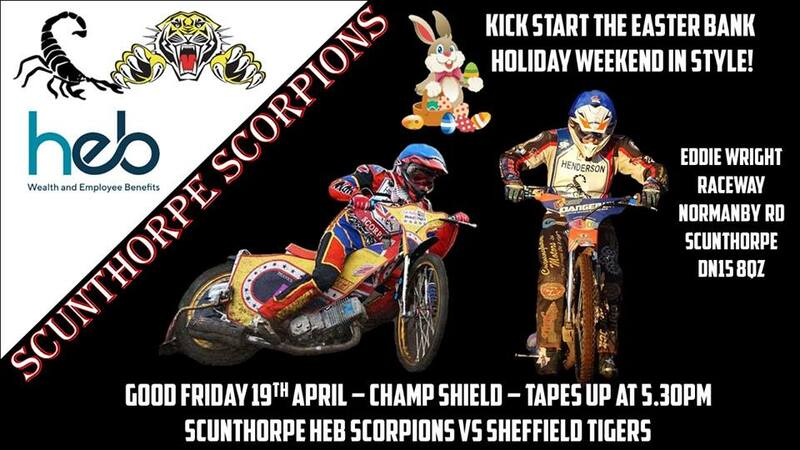 HEB Scunthorpe Scorpions face a tough test, as they welcome local rivals Sheffield Tigers in Championship Shield action to the Eddie Wright Raceway today (Good Friday, 5.30pm). Scorpions require a victory to stay in the mix for a semi-final spot of the Championship Shield. Sheffield are led by former British Champion Danny King and also include 16-year-old wonderkid Drew Kemp in their line-up. Scunthorpe promoter Rob Godfrey says: “As far as fixtures go, they don’t come much bigger than Sheffield at home. “The Tigers have put together a very attractive side, and I’m sure plenty of their fans will make the trip along the M18 to see them in action. “We need our fans right behind the boys. We’ve taken a couple of victories at the Eddie Wright Raceway so far this season and we need to make it a hat trick. Scorpions’ No 1 Josh Auty requires three or more points to become the first-ever Scorpion to score 3000 points for the club. Meanwhile, a change in riding order sees Danny Ayres move to No 2, while Stefan Nielsen will now be at No 4. Team manager Dave Peet explains: “I’ve spoken to the lads and we’ve decided to swap Danny and Stefan in the line-up. “Heat 14 has been our Achilles’ Heel, and we’re expecting Stefan to make that race his own, just as he has done with Heat 8. “Heat 8 is protected, with no tactical substitutes allowed, and I feel that Danny and Josh Bailey can more than hold their own in that race. HEB Scunthorpe Scorpions: 1. Josh Auty, 2. Danny Ayres, 3. Jason Garrity (captain), 4. Stefan Nielsen, 5. Jake Allen, 6. Ryan Kinsley, 7. Josh Bailey. Sheffield Tigers: 1. Danny King, 2. Drew Kemp, 3. Kasper Andersen, 4. Ty Proctor, 5. Kyle Howarth, 6. Broc Nicol, 7. Zaine Kennedy.